Make your own Chalk Paint in ANY Color! Mixes easily into any latex or acrylic (water based) paint. Get the exact color chalk paint you want. 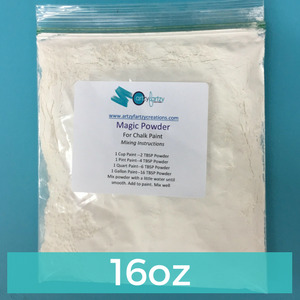 Much more affordable than pre-mixed chalk paints. No More Waste! You can mix just the right amount. You can use ANY flat or matte latex paint from ANY manufacturer. I buy a sample of paint at Home Depot for $2.98 and add 2 TBSP of my Magic Powder. THAT’S it! Shipping is $7.99 flat rate via USPS Priority Mail. With Shipping & Handling, expect your package in 7-10 days. Thank you!